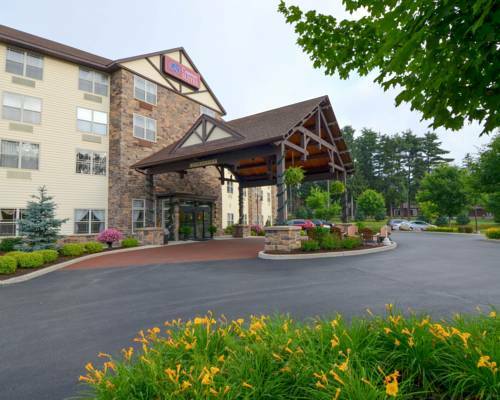 Get more of the space you need to spread out, relax or work at the smoke-free Comfort Suites hotel, a member of the Choice Privileges rewards program, in Lake George, NY near Six Flags Great Escape. Other nearby sites and activities include Million Dollar Beach, Lake George Factory Outlets, Natural Stone Bridge and Caves, Hyde Collection museum and Prospect Mountain Veterans Memorial Highway. Enjoy free hot breakfast, free WiFi, an indoor heated pool, exercise room and a business center with Internet availability and copy, print and fax services. Your spacious suite offers 25 percent more space than the traditional room and amenities like a flat-screen TV, microwave and recharge device. All Comfort Suites are smoke free. There is a 150.00 cleaning fee if guest smokes in room. Guest must be age 21 or older. John P. Bowman's extravagant 19th century mausoleum, eternally attended by himself as a marble mourning man. ~42 miles from Lake George. ~46 miles from Lake George.